Headwinds is the story of a man living ‘on the lower cheek of the world where the tears fall and turn to ice’ who is simultaneously muser and maverick. Lindsay Pope’s combination of the domestic and the wild, of fables and personal disclosures, has created a beguiling first collection. Lindsay Pope was born in Dunedin and lives in Nelson. His poetry has appeared in publications and online literary journals, in New Zealand and overseas. 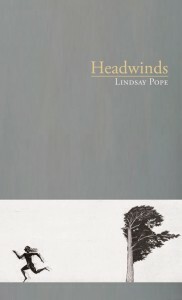 Headwinds is his first book of poetry.